Chandigarh:- As per media reports a CBI court in Chandigarh is all set to resume trial of Punjab CM Beant Singh assassination case against Bhai Jagtar Singh Tara. Seven months after Jagtar Singh Tara was arrested from Thailand, the court has directed the CBI to produce the record in the 1995 case on August 20. The court has issued directions to the Burail jail officials to produce Bhai Tara through video conferencing on that day. 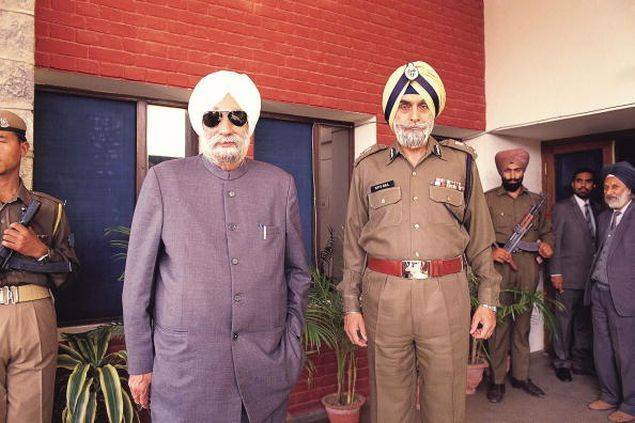 This early 1990s photo shows the-then Punjab CM Beant Singh (left) with Punjab DGP KPS Gill. It may be recalled here that Bhai Jagtar Singh Tara was arrested in January this year, about 11 years after his escape in 2004 from the high-security Burail jail. As per The Tribune (TT), [t]he move to initiate trial in the Beant Singh assassination case against Jagtar Singh Tara follows a request by Burail jail authorities who had first written to the court to initiate the trial following his arrest. “The court had issued a notice to the CBI. The CBI filed a reply on August 3 following which the court has summoned the record in the case and written to the Burail jail authorities to produce Tara through video conferencing on August 20″, notes a news report in Aug. 06 edition of The Tribune. It is notable that trial of Beant Singh assassination case is required to be conducted the Burial jail itself in the wake of the notification under the 268 Code of Criminal Procedure (CrPC) prohibiting transportation of persons named in this case from the Burail jail. CBI had named 9 persons including Bhai Jagtar Singh Hawara, Balwant Singh Rajoana, Jagtar Singh Tara, Paramjit Singh Bheora, Gurmeet Singh, Lakhwinder Singh, Shamsher Singh, Naseeb Singh and Navjot Singh. Trial against other persons has already concluded. The court had sentenced Bhai Jagtar Singh Hawara and Balwant Singh Rajoana to death on July 31, 2007, however Bhai Harwara’s death sentenced was not endorsed by the Punjab and Haryana High Court and he sentenced was converted to imprisonment for life. Three persons Gurmeet Singh, Lakhwinder Singh and Shamsher Singh was sentenced to imprisonment for life, while Naseeb Singh was sentenced to 10 years imprisonment. Navneet Singh was acquitted in this case. Trial against Bhai Paramjeet Singh Bheora was held separately and he was sentenced to imprisonment for life on March 30, 2010.